Sister Patterson Comes to Salem! 1. Which Character Do You Prefer? MICHELLE PATTERSON AKA SISTER PAT CROSSESOVER TO SALEM! Only weeks after the axing of longtime vet John Aniston(Victor Kiriakis), some happier news comes to LIS for once! 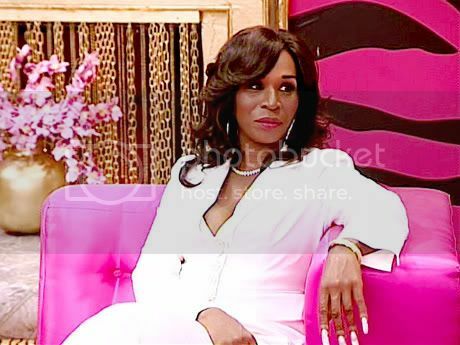 Michelle "Sister" Patterson will guest star on Life in Salem for two episodes this week...Patterson is best known for her role on reality show "I Love New York", where she she pops in as the crazy mother to New York. However, Patterson also plays one of the main heroines on former Co-HW/Co-EP ML Cooks' SONOP soap S.T.E.A.M. Sister Pat is a very crazy nut on that show as well, constantly having crazy antics as she pressures people to praise the Lord and attacks nearly everyone she sees in the town, though she's also been at the center of some very serious storylines as well. Pat comes to Salem this week to help Celeste Perrault(Tanya Boyd) after the death of Victor...and a very surprising connection to Celeste will be revealed! And the scenes shall be written by Cooks himself. AND, in other breaking news, soon-to-be GL alumni Gina Tognoni is joining LIS...also expected to appear this week! Tognoni is going to be playing a recasted April Ramirez, a role formerly played by Lisa Howard from 1988 to 1991. April was a bgi character at the time, but isn't the most famous character in Days....however, she will play a significant role in the Robin/Laura/Mike/Alexis/Jeremy/Cassie story. "I have always seen some potential in April...mainly now because of her and Mike's mess of a relationship...if fans remember right, Robin was the indirect reason they broke up a couple times...that will definitely come in to play here!" Tognoni joins with a short-term contract...but that could be changed!